When purchasing a boat, the first step you’ll take is determining what your exact boating needs are. If you’re going to operate a chartered fishing boat, you’re obviously going to need a different boat than you’d need simply for recreation. If you plan to water ski, you’ll need another type of boat as well. Another consideration: do you have the option of storing your boat at a marina, or are you going to want a smaller boat that can be easily moved with a trailer? When buying a boat, you may want to shop in an area that is close to the water. These areas usually have a far greater selection. 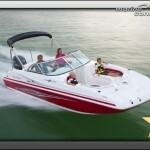 Once you know what kind of boat you need, you’re going to start comparing makes and models. This is where the voice of experience can come in handy, so be sure to check with friends or family about their own boat buying experiences. We usually recommend that boat purchasers start with a preowned boat. In addition to being affordable, used boats often come with an array of added-on electronics and parts. When looking at a used boat that you may potentially buy, we recommend that you check the boat’s history for accidents and other mishaps. If you do choose to purchase a new boat, your purchase will come with a warranty, and that can equal peace of mind. However, keep in mind that your boat can lose as much as 15% of it’s value the second that you tow it off the dealer’s lot. That loss of value will most likely counteract any savings that you see from owning a warranty, unless you plan on using your boat almost every day. Finally, keep in mind that though you can many buyers find deals when purchasing a boat from an individual, you must be beyond careful when making a deal like this. Always check proof of ownership, and be suspicious of deals that are unrealistically low. Particularly on the Internet, it is not uncommon to find unscrupulous parties who will try to talk you into sending them a down payment for a nonexistent boat. 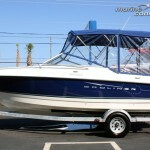 When purchasing a major item like a boat, many buyers choose to use an escrow service. An escrow service is a third party that will hold your payment until both parties, the seller and buyer, are fully satisfied. Once you’ve decided on a boat to buy, make sure that you have the boat thoroughly inspected by a professional; after making such a substantial payment, the last thing you’ll want is a nasty surprise. You’ll especially want to be very confident in your boat’s engine. If possible, try to have your boat look at by a member of the National Association Of Marine Surveyors. If everything goes well, you should be able to purchase your boat. As a boat owner, you’re part of an elite club. We hope you’ll have a lot of fun on the water, and stay safe, too. 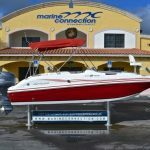 To have all bases covered with your boat purchase and to eliminate the middle man contact Marine Connection at www.marineconnection.com today!